After the first issue debuted to critical acclaim, Marvel is pleased to announce Ultimate Origins #2 has sold out at Diamond and will return with Ultimate Origins #2 Second Printing Variant! As more secrets are revealed, the demand for this March on Ultimatum tie-in has been staggering! The second issue of the shocking series by superstar team Brian Michael Bendis and Butch Guice, shined light on the origin of everyone's favorite Ultimate Star-Spangled Avenger, Captain America! Plus, an explosive new cover featuring the interiors of Butch Guice! 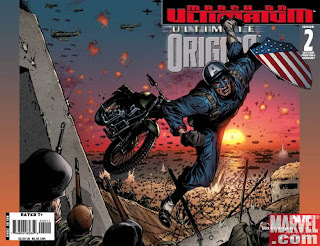 James Hunt of ComicBookResources.com raves, "As with the last issue, however, 'Ultimate Origins' is proving itself to be a strong read that expands the history of the Ultimate Universe -- past and present..."
How does Captain America's transformation from everyday, ordinary guy to super hero affect the very core of the Ultimate U? What is the exact truth behind the Super Soldier Experiment? Make sure not to miss your second chance to find out in Ultimate Origins #2 Second Printing Variant! Marvel would like to thank retailers for their tremendous support of Ultimate Origins!